Rabbi David Greenberg was born in Russia about 1869 to his father Jacob Greenberg. Rabbi Greenberg spouse’s name was Dinah. His address was 1514 S. Clifton Park Ave. 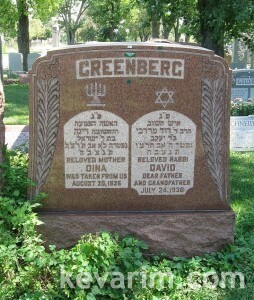 Rabbi Greenberg died at the age of 67 on Jul 23 1936 and was buried on the 24’th.